A passion to provide Filipino families and children with accessible nutrition. Alaska Milk has been there to fuel the passions of a nation. To be the leading providers of affordable nutrition by offering families and children a wide range of delicious, high quality dairy, and dairy-based products. Alaska Milk Corporation’s valued commitment is to bring nutrition to every Filipino across all stages and occasions of their lives. Alaska Milk faces up to the challenge of pursuing the efforts to help raise milk consumption levels in the country. Today, the Philippines remains to have lower per capita dairy consumption levels when compared to our Asian neighbors. By providing dairy products in the right formats and price points, Alaska Milk helps provide good health to every child in every Filipino home and contributes in bringing down malnutrition levels in the Philippines and in the world. We pledge to continue building on the strengths and competitive attributes of our brands and develop their full product potential. We will continue to identify market opportunities while developing new products, mindful of our task to be responsive to the ever-changing and growing needs of our consumers. Customer relationship is an integral part of building our business. We aim to provide our partners in the trade the best and most efficient service, making use of up-to-date technology for timely product availability and accessibility. We strive to know and understand our customers fully to bridge the gap between what they need and what we can give. Ultimately, the consumers whom we serve and their level of satisfaction with our products become our final judge and jury. Through high levels of quality control, we are committed to deliver high quality milk and dairy- based products from production to consumption. We recognize that our people, the Alaska Milk team members, are one of our most important assets, and we are committed to promote their safety and welfare. Their wealth of experience, ideas, dedication and strong work ethic lay the foundation for Alaska’s continued success. It is our goal as much as it is theirs, to pursue and reach their full potential through continued education, training, and skills-enhancement programs. We challenge each individual by providing the opportunity to contribute to our endeavors. Growth that creates value for our stakeholders is paramount. We will deploy our resources on investment opportunities that are within our core competence and yield high returns relative to risks and consistent with our growth objectives. With more than 45 years of history, Alaska Milk has no shortage of memorable moments. Here are the milestones that made ours the leading milk company in the Philippines. Holland Milk Products, Inc. starts local production of Alaska Evaporated Filled, Sweetened and Chocolate Sweetened Condensed Milk. Alaska liquid milk achieves brand leadership. Alaska launches the “One-on-One" campaign featuring basketball star Cisco Oliver and Michael the Alaska boy; “Galing mo, man" and “Wala pa rin tatalo sa Alaska" become two of the most memorable advertising lines of all time. The “One-on-One" campaign is extended to feature the sports soccer and tennis, and wins awards of excellence in advertising. Alaska improves labels to suit the changing times. Alaska launches advertising campaign to encourage use of Alaska liquid mild in food preparations. Alaska expands its product line to include Powdered Filled Milk. Alaska features Asia's “Sprint Queen," Lydia de Vega, in its latest advertising campaign. Alaska obtains a franchise in the Philippine Basketball Association, the country's professional league. Alaska Choco is introduced in the market. Alaska Powdered Filled milk 80g pouch, today's fastest selling size is introduced. Alaska liquid milk exceeds ₱1B annual sales and maintains its position as market leader. Alaska team wins its first championship title in the PBA Third Conference. Alaska Powdered Filled Milk surpasses ₱500 M mark in annual sales. “Galing mo, Mom" campaign with the Lastimosas is launched. Alaska launches public-service campaign promoting good values among Filipino children using its basketball team. Alaska starts its sports development program for school children through Power Camp. Alaska team bags the Governor's Cup title in the PBA Third Conference. “Lakas-Alaska" campaign with Johnny Abarrientos kicks off. Alaska strengthens its commitment to sports development by supporting the inter-collegiate league, NCAA. The Alaska team turns ten and becomes repeat champion of the PBA Governor's Cup. Alaska Milk Corporation is listed as public corporation. Alaska launches "Drink Your Milk" campaign with Pops Fernandez and her kids. Alaska celebrates twenty-five years of bringing nutrition into your homes. Alaska Liquid Milk has maintained brand leadership, while Powdered Filled Milk has become a major player. Together, they generate over ₱28B in annual sales. Alaska Aces wins PBA ALL-Filipino Cup, PBA Centennial Cup and PBA Commissioner's Cup. Alaska signs a strategic alliance with NABISCO as their exclusive distributor. Alaska acquired ATCI, a distribution company, and created their own sales force. Acquires distribution of Quaker Oats. Sharon Cuneta becomes the Alaska Liquid Milk celebrity endorser. Alaska Aces wins their 10th title in the league. Alaska Powdered Filled Milk re-launches with "Lakas Nutribuilder". Alaska launches the “Growth Gap” campaign, highlighting a crucial period in a child’s development. Within two years, Alaska was able to double its market share from 10% to 20%. Alaska Aces wins 2003 PBA Invitational Cup. Alaska Milk launches Alaska Crema All-Purpose Cream. Alaska signs a strategic alliance with Hershey International to acquire license for Hershey Ready-To-Drink milk. Alaska signs an agreement with Kellogg's. Re-launches Alaska Evaporada and Condensada. 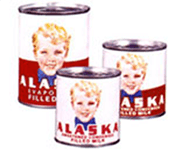 New looks for Alaska Evaporated and Sweetened Condensed Milk. Alaska launches its Value Line, targeting “Momprepreneurs” with specially-priced Alaska Evaporada and Alaska Condensada. Today, the Alaska Value Line is a P2.5-billion business. Alaska and Nestle Agree on Sale and Licensing of Canned Milk Business. WILFRED STEVEN UYTENGSU, JR., President and CEO of Alaska Milk Corporation, is named the 2007 Entrepreneur Of The Year Philippines. The Entrepreneur Of The Year was founded in the United States by professional services firm Ernst & Young in 1986 to recognize the achievements of the most successful and innovative entrepreneurs worldwide. Alaska Milk Corporation introduces Alaska Yoghurt Drink, a ready-to-drink milk naturally fermented with good bacteria which help in proper digestion. Alaska Milk Corporation introduces the new look of Alaska Choco. Alaska Yoghurt Drink extends its line. Available in four flavors: Strawberry, Blueberry, Green Apple, and Orange. Alaska Milk relaunches “Alaska Choco!" and “Alaska Sweet Milk!" with a new look. Alaska Milk hits ₱10 Billion mark in revenues. Alaska Powdered Milk Drink introduces the 33g pouch, a pack size for single-serve consumption. Enters a new category with Krem-Top Coffee Creamer. Alaska Aces celebrates its 25th year as a PBA team. Alaska Football Cup turns 15. Advertising campaigns win awards in effectiveness & societal values (Araw Awards, Tambuli). Alaska brings IronKids to the Philippine youth sports programs. Alaska Milk signs a three-year partnership contract with NBA, the world's leading and most popular basketball association, through its Jr. NBA Program. Launch of Alpine Sterilized Milk. Alaska Value Line's Summerap Campaign won Gold for Best Innovative Campaign in Tambuli Awards. Alaska announces its partnership with FrieslandCampina. Through FrieslandCampina’s larger portfolio, new brands are introduced into he Alaska family of products. Alaska Celebrates its 40th Year anniversary. Launch of Alaska Chocolate Powdered Milk Drink. Launch of Alaska Nutribuild 345. Alaska Milk Corporation wins the 2012 Panata Silver Award for Alaska Evaporada and Alaska Condensada’s “Buena Mano”, “Patak-Patak”, and “Noche Buena” TVCs under Brand Marketing- TV Category while the Ginang Alaska Campaign wins the Silver Award for Brand Marketing- Special Events Category. Alaska Value Buenas Campaign wins Silver Award for Established Brand Category and Ginang Alaska Campaign won Silver for Integrated Promo and Activation-led Prolgram in the Tambuli Awards 2013. 14-time Champion Alaska Aces wins the 2013 PBA Commissioner’s Cup. Alaska Milk Corporation wins the Agora Awards Marketing Company of the year. Alaska Aces head coach Luigi Trillo wins the Philippine Basketball Association Coach of the Year Award from the PBA Press Corps. Alaska launches the San Pedro Laguna Plant “Master Plan”, a plan that revolutionizes the facilities with state-of-the-art advance technologies to keep up with the times. The New Condensed Milk Plant is launched and opened. Krem-Top Bida Changers wins Silver Araw Values Awards for Love of Country and Respect for National Customs and Traditions. PlayPH wins Bronze Araw Values Award for Jr. NBA Our Language. PlayPH wins Branded Content Grand Panata Award for values-based marketing. PlayPH wins Bronze Boomerang Award for Program/Service Category. Alaska partners with the Department of Education for the Adopt-a-School Program. The “Master Plan" marks its completion with the opening of the New Milk Powder Plant, Condensed Milk Plant and all other major Alaska Milk facilities. Beyond producing top-quality dairy products, Alaska Milk Corporation prides itself on being a community-minded company – actively helping to strengthen the nation from the grassroots through our social responsibility programs. Through our partnership with Gawad Kalinga, the Alaska GK Village was established in San Pedro, Laguna. This partnership has helped build comfortable homes for over 120 families, as well as given homeowners numerous livelihood projects and opportunities. Since 1999, Alaska Milk, through its partnership with Children’s Hour, has funded programs focused on education, nutrition, and development of Filipino children. We are dedicated to helping maximize the potential of every child to help shape a brighter future. Alaska Milk and DepEd’s Adopt-a-School program aids in the upgrading and modernizing of public schools. Through this program, Alaska Milk looks after the educational and nutritional needs of schoolchildren, beginning with those from the country’s 20 poorest provinces. Alaska Milk works hand in hand with Bantay Kalikasan to address and educate the Filipino people on the need to preserve our planet’s natural wonders for generations to come.